This dialog allows the Access Manager application to be customized based on the user preferences. The application will be visible in both the Task Bar and System Tray. When minimized, the Task Bar or System tray icon can be used to re-display the window. The application will be visible in only the System Tray. When minimized, the System tray icon can be used to re-display the window. The application will be visible in only the Task Bar. When minimized, the Task Bar icon can be used to re-display the window. 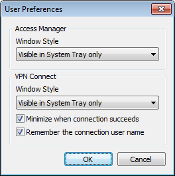 This dialog allows the VPN Connection application to be customized based on the user preferences. When this option is enabled, the client will automatically minimize to the Task Bar or System Tray after a connection succeeds. When this option is enabled, the client will automatically remember the last user name entered for the connection. If the connection window is closed and then re-opened, the user name will automatically be entered.